One Taste Too Many by Debra H. Goldstein is a cozy mystery novel that starts off with a death, and takes the reader on a ride of “who did it” and a series of complications, twists, and turns! There is so much at stake, and some things aren’t even seen immediately due to all of the chaos swirling all around the characters. So buckle up and get ready for a story that will hook you in as you scramble to figure out who is the guilty party…and why. 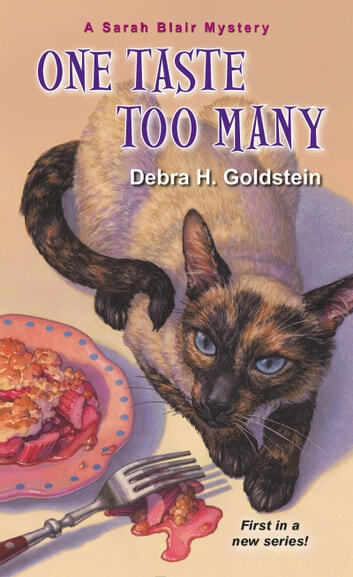 One Taste Too Many by Debra H. Goldstein is the first book that I have read by this author and once I got a taste of this book I couldn’t put it down. The author introduced me to twin sisters Emily and Sarah. Emily is a chef at Southwind, and due to being in the right place at the wrong time is suspected of murder. The victim? Sarah’s ex-husband Bill. While on one level I would have liked more background into Sarah’s and Bill’s former marriage and the details of the divorce, the author quickly kicks things into high gear when Sarah finds herself facing some legal woes herself. Catnapping and theft?! What?! Yep! Somebody seems to have it out for the sisters! Thankfully Sarah’s employer, Harlan, is willing to be a generous soul and help them out pro-bono. Something isn’t right though, and when another body drops more suspicion is thrown onto Emily. Sarah has her suspicions, but without solid proof, what can she do? There is a lot riding on the truth coming out, but can it come out before Sarah loses everything? And I mean EVERYTHING! This is a great story! Now! Am I saying that you’re never going to get annoyed with the characters? Absolutely not! LOL! There are moments where I got annoyed with both sisters. Sarah learns that her sister is keeping lots of secrets, but she’s not the only one. Sarah gets annoying, too but I just get annoyed because she gets impatient or short with people out of frustration. All in all, this is a well-written book and I enjoyed it immensely. The author gives the reader a dynamic cast of characters and keeps the reader guessing as to who the guilty party is almost until the very end. Just when you think it’s one person, the story slides to make you guess again. I love it! If you enjoy cozy mystery novels that throw in a few red herrings and keep you guessing then this is the book for you! I am rating this book 5 out of 5 stars. While “One Taste Too Many” may have been the case for unfortunate Bill, it won’t be the same for me. I look forward to reading more books by this author in the future. One Taste Too Many by Debra H. Goldstein is the first A Sarah Blair Mystery. Sarah Blair is a twenty-eight year old divorcee living in Wheaton, Alabama in a small studio apartment with her Siamese cat, RahRah while working as a receptionist for a local lawyer. Sarah is awakened during the night by a phone call from her twin sister, Emily. She is at the police station and the prime suspect in death of Sarah’s ex-husband, Bill. Sarah immediately calls her boss, Harlan and rushes to the police station. Peter Mueller, Wheaton’s police chief, is questioning Emily when Sarah and Harlan arrive at the station. Emily is a chef at Southwind, a local upscale restaurant, and in charge of the Southwind booth at the upcoming Food Expo. She states Bill called and told her there was a problem and to come down immediately. Emily found him on the floor of the Southwind booth covered in her rhubarb crisp. Then Jane Clark, Bill’s latest love interest, shows up and accuses Sarah of stealing a bracelet and RahRah (oh no). After leaving the station, Emily suggests that Sarah work the Food Expo with her, so they can track down the real killer. It will also allow them to get close to Jane and figure out what plan she is cooking up. They only have one little problem—Sarah is severely lacking in culinary talent (heating up takeout is the extent of her skills). When Emily is arrested for Bill’s murder, it is up to Sarah to cut through the clues and suspects. Can Sarah solve the case before Emily’s becomes the prison’s new cook? One Taste Too Many is a lighthearted cozy mystery. This cozy mystery features plenty of mouthwatering food and a smart Siamese cat named RahRah. I liked the steady pacing and smooth flow between sections. Sarah and her twin sister, Emily may look alike, but they have very different personalities and talents. Sarah has divorced her cheating husband, but she has yet to discover what she wants to do with her life. While Emily is a talented chef, Sarah has no culinary talents. Actually, Sarah is not sure if she possesses any special skills or talents. Sarah is grateful for her cat, RahRah (my favorite character in the book). RahRah originally belonged to Mother Blair and, after her death, Bill asked Sarah to take him since he is allergic. It turns out that Bill forgot to mention that Mother Blair set up a special trust for RahRah with a stipend for his caregiver along with a place to live (must have slipped his mind). After Bill’s death, all the evidence points towards Emily as the killer. Emily convinces Sarah to help her ferret out the truth. There are several suspects with motive to want Bill dead and there are good clues to aid readers in resolving the crime. I was disappointed that the murder occurred before the book began. I would have appreciated the author taking the time to develop the main characters further (to know more about their past). Further information on Harlan would also have been nice—like his last name (did I miss it?). There are two recipes at the end of the book. One Taste Too Many will appeal to those who delight in pet and food cozy mysteries with a perplexing whodunit. Do not miss the first new diverting tale in A Sarah Blair Mystery series.